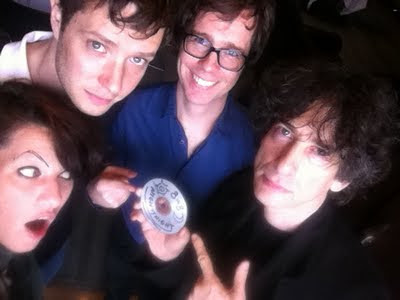 Neil Gaiman's Journal: SUPERGROUP MADNESS! Actually, it had a lot more in common with Roger Corman, who, when asked why he'd made the original film of Little Shop of Horrors, explained, "We were going to play tennis but it was raining that weekend." Amanda suggested we do something interesting, Ben said why not make 8 songs in 8 hours? and Damian and I were seduced and sucked in by their madness. Honestly, if they jumped off a bridge, we'd probably jump off too. Here's a picture of us done last night by artist Cassandra Long - the four principals and Sean Slade, our producer. Well, we set out to record 8 songs in 8 hours, actually recorded six songs in six hours, with help, suggestions, kibbitzing, and suchlike from the good folk and dangerous insomniacs of Twitter. I had expected that my job would be REALLY EASY. All I had to do was write lyrics. I knew I could write the lyrics for songs in less than 8 hours... I didn't have to write songs, play an instrument or even sing. It wasn't easy. It was always fun, though, even when it was hard. And by 3 am when I realised that I'd written some lyrics for a song that had to be sung by someone with an English accent, I just said sod it, and did my best to channel John Reed (you probably don't know who John Reed was, but he was my hero when I was eleven, and the mainstay of the D'Oyly Carte Opera Company) and to talk in tune, like Rex Harrison, rather than go "OmigodIaminarecordingstudioandIhavetoactuallysingnowwithBenFoldsplayingpianothisisincrediblystressfulargh"
I just swallowed my nerves and did it. The songs are a mixture of funny and sad and odd. I found myself trying to write Amanda-ish songs for Amanda, Ben Foldsish for Ben, Damiany for Damian, and, er, I don't know, a sort of Tom Lehrer-W.S. Gilbert for me. Then we went to sleep for three and half hours. 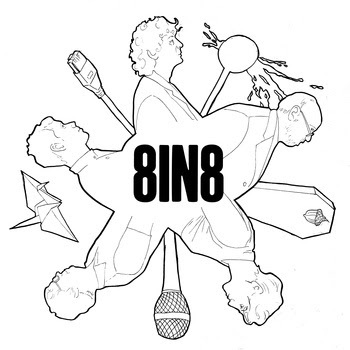 Our supergroup, which we called 8in8, after the hashtag we'd been using, and because the only other suggestion was B.A.N.D. after our initials, had by that point its first album up for sale on Bandcamp. We got up on stage at the ReThink Music conference and talked about what we'd done and why and played the audience bits of each song, and explained it. Oh, and we gave it a title, which is explained in this article from the Boston Phoenix Blog. Also, because we were very tired. Here's the panel from this morning. We were very sleepy. Since then, we have slept for half an hour. We are still very sleepy. You can go and listen to it at http://music.amandapalmer.net/album/nighty-night. You can download it - minimum payment a dollar, it goes to charity, and your money will bring good things to the children of Boston. The goal was to do something more fun than going out to dinner together and catching a panel, and we did that, and also to show people that creativity isn't always a matter of magic and inspiration. Mostly it's a matter of work. Of doing it. And I hope we did that too. There were songs that didn't make it, things that never gelled, but with all that, the best part of it was when when stumbled away from the studio, six songs that hadn't existed before existed now. Huge thanks to the people of Twitter who suggested (whether they knew it or not) that we write about Nikola Tesla, Because the Origami, One Tiny Thing Out Of Place, A Squirrel Suicide, and Joan of Arc, and thank you to the lady with the mirror we saw on the way to the studio, shouting at herself in the glass, who made us want to write a song about mirrors.